Architect of National African American Museum Works with Clemmons Family Farm. Amy Lilly. February 20, 2019. Seven Days. 'The Intrepid Couple' Samples Jack and Lydia Clemmons' African collection. Rachel Elizabeth Jones. January 19, 2019. Seven Days. Clemmons Farm connects with D.C. museum architect. Chea Evans.​ July 26, 2018. The Citizen. Clemmons Family Farm Launches Humanities Speakers Series. July 19, 2018. The Citizen. Growing Culture: The Farm- to-Art Movement in New England. July/August 2018. Cynthia Close. Art New England. Clemmons Family Farm: Making History, Creating Places. June 23, 2018. ArtPlace America. Clemmons Family Farm Making History, Creating Place with Acclaimed architect Zena Howard. Roz Whitaker-Heck. June 13, 2018. The Charlotte News (page 6). Vermont House of Representatives presents Clemmons family with A Sense of Place resolution. Clemmons Family Farm. May 16, 2018. The Charlotte News. Christal Brown Named Director of Visual & Performing Arts at Clemmons Family Farm. Rachel Elizabeth Jones. April 12, 2018. Seven Days- Live Culture. Historic Clemmons Farm Becomes a Multicultural Center. Cynthia Close. Spring 2018 edition. Vermont Woman. Farm Wins Preservation Grant. March 23, 2018. The Citizen. State Barn and Historic Preservation Grants Awarded to 33 projects across Vermont. March 16, 2018. Vermont Digger. Clemmons Family Farm Awarded 2018 Barn Preservation Grant. March 8, 2018. Charlotte News. Hidden History: Clemmons Family Farm. Amanda Thibault. February 22, 2018. My Champlain Valley.com ABC Local Television News Channel 22. African-American Culture Thriving at Clemmons Family Farm. February 1 2018. Think Vermont. How Did Your Family Get to Vermont? Connor Cyrus. January 15, 2018. WCAX Television News. The Clemmons Family Farm Moves Onward and Upward. Susan Crockenberg. January 10, 2018. The Charlotte News. ​Clemmons Family Farm Wins $350,000 National Grant. Chea Evans. December 14, 2017. The Citizen. Clemmons Family Farm Receives ArtPlace America Grant. Sadie Williams. December 5 2017. Seven Days. ​Living Our Lives as Elders. Lydia Clemmons (Senior). July 26, 2017. The Charlotte News. An African American-owned Farm becomes a Heritage Site. ​Sadie Williams. July 12, 2017. Seven Days. Above: Oldest African-American-owned Vermont farm looks to make new history. Eva McKend. June 11, 2016. WCAX News. Charlotte Farm Celebrates African American Heritage and Culture. Melody Bodettte. July 5, 2017. Vermont Public Radio. ​Clemmons Family Farm is Grant Finalist. Chea Evans. June 28, 2017. The Shelburne News. 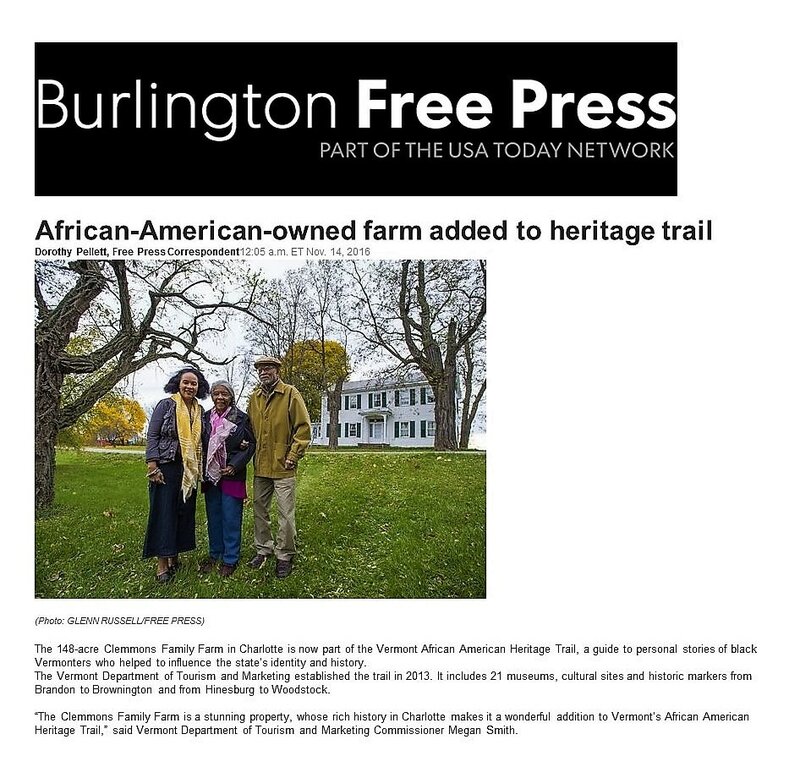 A Vermont Family Farm Celebrates African Heritage. Celina Colby. Bay State Banner. June 21, 2017. Buffalo Soldiers: Vermont Legacy Recognized. Tom Marble. May 4, 2017. The Essex Reporter. ​Vermont announces additions to African American Heritage Trail. News Release: Vermont Department of Tourism and Marketing. April 26, 2017. VT Digger. Local Farm Family to Compile Oral Histories. Lydia Clemmons. March 23, 2017. Charlotte News. African American-owned farm added to heritage trail. Dorothy Pellet. Nov. 14. 2016. Burlington Free Press. Kickstart with Art: The Clemmons Family and the reinvention of a Vermont Farm. Geeda Seerfoorce. May 5 2016 (page 2). Charlotte News.